Horror's ultimate survivor reveals details about Papa Ash and eight more things about the third season. 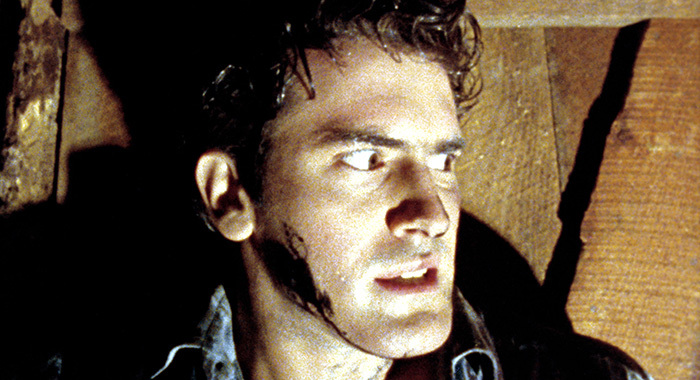 Ash Williams (Bruce Campbell) may be the greatest survivor in horror history. Nobody else, except for maybe Jamie Lee Curtis, has survived three movies in a franchise, and not even she got a Halloween TV series. Entering season 3 of Ash vs Evil Dead, Campbell says they may have finally found Ash’s breaking point. Chopping up all of his demonically possessed friends in the woods didn’t break him. Traveling back to medieval times to fight more “Deadites” didn’t do it. Returning to Elk Grove, and the 1980s, didn’t do it. So what could season 3 have in store that Ash hasn’t faced yet? 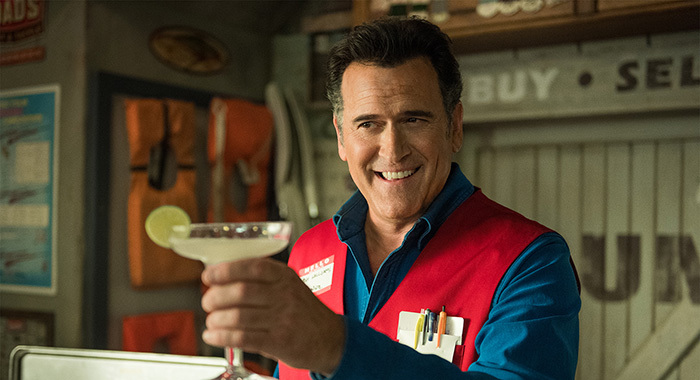 Bruce Campbell spoke with Rotten Tomatoes by phone while he was on a book tour for his second autobiography, Hail to the Chin: Further Confessions of a B Movie Actor. 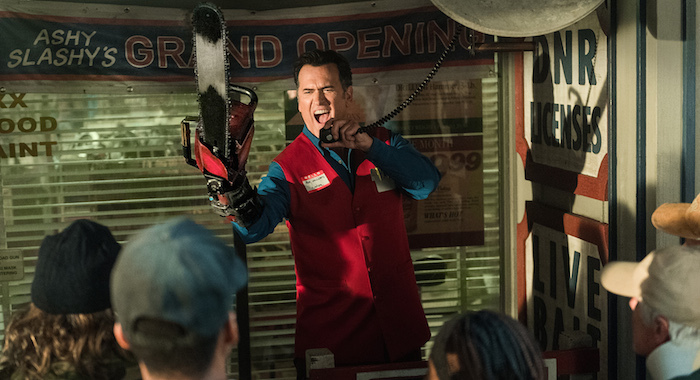 Campbell teased Ash’s breakdown and eight other things about the new season and the Evil Dead franchise as a whole. Army of Darkness let Ash go medieval on an army of Deadites. The Bard comes a little later in history, but Campbell says Ash will feel the burden of a Hamlet or Macbeth. To chainsaw or not to chainsaw. That is the question. Since Ash became a hero of Elk Grove, he stuck around to capitalize on it. What other kind of store could Ash Williams open but a hardware store? You’ll see his commercial for Ashy Slashy’s Hardware in the season premiere. The Williams family keeps growing. Ash’s dad (Lee Majors) is promised a return, even though he splattered in season 2. In season 3, Ash meets his long-lost daughter, Brandy (Arielle Carver-O’Neill), and — wouldn’t you know it? — she takes after Dad. Honestly, it’s surprising that this is Ash’s first offspring. If he’d hung around the Middle Ages another nine months, he might’ve found out about more. “I would expect that he might have some lineage back then, yeah,” Campbell speculated. It’s been some 35 years of Ash chainsawing demons. At a certain point, he’s got to face the facts. It’s not just a coincidence he keeps reading from the Necronomicon. With new cast members joining the fight, there isn’t quite so much pressure on Campbell to do all the gore and action. You’ll see him in an epic Deadite battle using all the instruments of a high school music room in the season premiere, but then his costars share the load. But it’s all integral to the plot, of course. 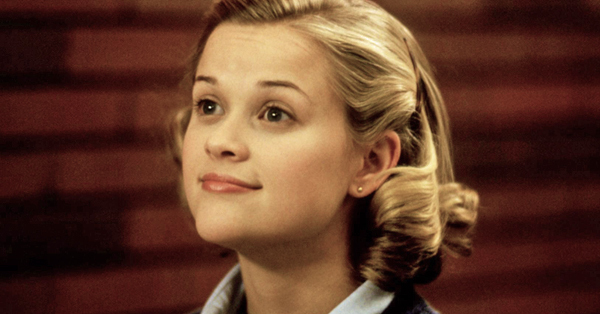 “Ash is an idiot,” Campbell said. So he admits that and embraces Ash’s most bonehead moves. But the important thing is that Ash remains the good guy. He’ll always be our man with the chainsaw. Season 2 had Ash return to the cabin in the woods in the ’80s. This was after he returned to Elk Grove to answer for the town’s suspicions when he returned alone from the camping trip in Evil Dead 2. Williams suggested the audience not concern themselves too much with the chronology of events. That’s not what’s important here. It did answer a question everyone had to be wondering though: What would regular people think of his missing friends and this crazy story about demons and time travel? The Evil Dead served its purpose. It launched director Sam Raimi, producer Rob Tapert, and Campbell’s careers. But they’ve all moved on. The original The Evil Dead was more of a straight horror movie, but they’re not nostalgic for that. They’re happy with the transition to comedy in the sequels and TV series. The Evil Dead movies were locked in a trilogy for decades. There was a remake that could’ve started a new film series, but it’s been Ash vs Evil Dead that brought back hope for a new Ash movie. Campbell says keep waiting. By the end of season 3, this story line will beg to continue with another season. Nothing is guaranteed on television, but Campbell is pushing for a fourth season with all his might. Ash vs Evil Dead season 3 premieres on Sunday, February 25 on Starz.